Leading mobile services provider Smart Communications is changing the way Filipinos enjoy their smartphones as it unveils GigaSurf50, the country's first 1GB data offer at P50. 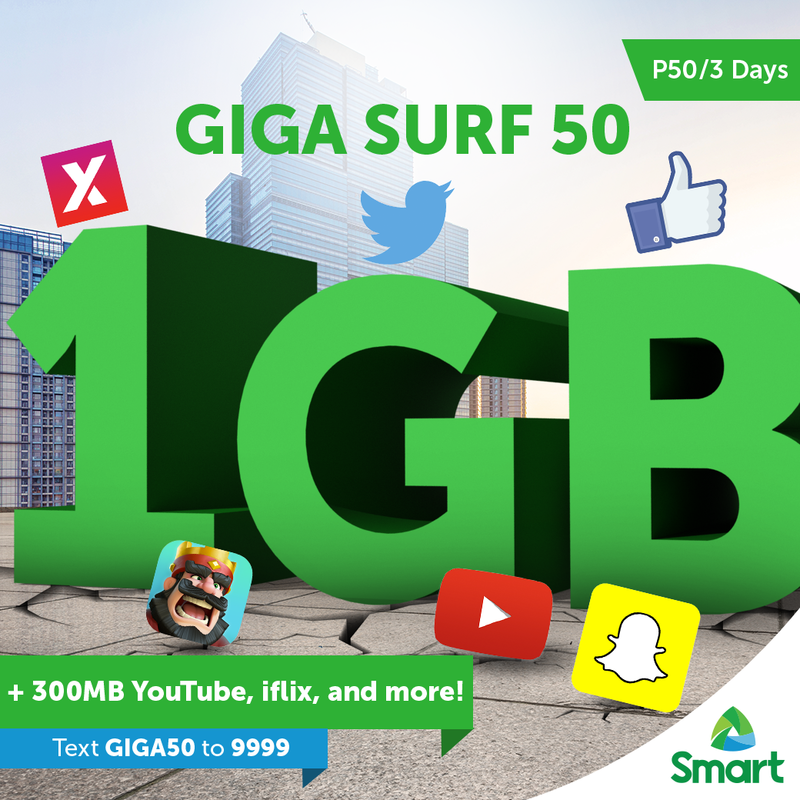 Valid for three days, GigaSurf50 also comes with an additional 300MB for streaming on sites YouTube, iflix and more, empowering subscribers to ride the digital wave and enjoy more data, video and music right at their fingertips. To enjoy this latest offer, simply text GIGA50 to 9999. GigaSurf50 is also big enough for subscribers to share with others through Pasadata, Smart’s innovative feature that lets subscribers pass on a chunk of their data to friends and loved ones. To share part of your GigaSurf50, simply text PASADATA <Recipient #><Amount>MB and send to 808. GigaSurf50 also lets you record more of your day’s best moments on Snapchat and Instagram, share more of your latest musings on your personal blogs, and connect more withyour groups on Messenger, Viber and Whatsapp, among many others. Smart recently launched its P1,288 Prepaid Smartphone kit to offer the most value-packed big-screen smartphone in the country today, meant to break barriers for many Filipinos to own a smartphone. Smart also recently unveiled its Smartlife app, a breakthrough digital discovery portal that lets subscribers enjoy exclusive daily perks, movies, music and games at their fingertips.